Mayfield provides high quality uPVC balustrades for decking. Our uPVC balustrades are manufactured by us and provides exact colour matching to your chosen decking design if required. 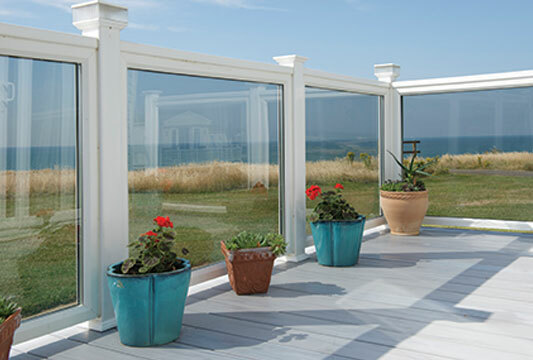 If your holiday or park home has a fabulous view, why not make the most of it with our ClearView decking balustrades. Clear glass panels have many advantages over traditional picket designed balustrades and are one of the most popular upgrades for our customers who like to make the most of their views. ClearView decking balustrades are available in framed and frameless designs with clear, tinted, obscured and sandblasted options, providing protection against the wind and adding a touch of opulence. Double glazed units with handrail mounted on top. Superb wind protection obscured and sandblasted. Additional toughened and laminated sizes. Sandblasted options including park logos/designs. Hampton decking comes in a choice of two uPVC balustrade styles and five colour options, with the LED top handrail as standard (LED light strip additional accessory). Focus decking is available in one balustrade style and two colour options. All our decking balustrades have been designed to fit seamlessly with your choice of decking and structurally engineered to British Standard BS6180. Our decking balustrades are installed using fewer newel posts offering a more contemporary design without sacrificing strength. 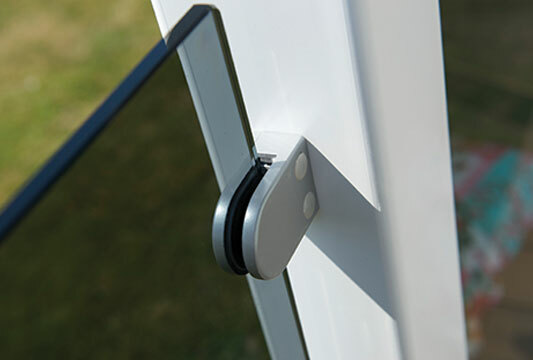 The brackets used on our uPVC balustrades feature concealed fixings and external radiuses. Each newel post comes with a Windsor collar, while the Hampton range features a matching Windsor post cap to give a beautiful uniform finish. These are unique features to Mayfield. All our balustrades for decking options include an LED top rail. LED lights are sold separately. Two balustrade options and five colours are available with Hampton decking.